Site123 only has one template, but is this a bad thing? Our review looks at the features available on its free sitebuilder plan. Founded in 2015, Site123 is an Israel-based company offering a free, easy-to-use site builder geared toward individuals or small businesses. The Site123 sitebuilder can be used by a novice that has never built a website before. Its intuitive editing interface assumes no prior design experience or technical knowledge. Using the built-in wizard, abundant help features, and video tutorials, you can be up and running with a website that reflects your brand in just minutes. Everything else — the back-end server configuration, responsive design, and SEO — has been taken care of by Site123. What are the Main Site123 Features? Does Site123 Offer E-commerce Options? How Does the Site123 Website Builder Work? Will My Site Work on Smartphones? What Types of Editing Features Does the Site123 Sitebuilder offer? What Search Engine Optimization (SEO) Features Does Site123 Offer? How Much Does Site123 Hosting Cost? How do I Reach Site123 Support? Conclusion: Is Site123 Right for You? Does Site123 offer a range of templates? How do I get hold of Site123 support? How much bandwidth do Site123 plans come with? Site123 includes a host of features that ensure that you can build the site you want and provide your visitors with the best possible user experience. Responsive: By default, all sites created using Site123 are responsive, so depending on the device your visitor is using, they will see a site sized for their device. Mobile phone users won’t see a site with minuscule font — they get their design that makes it easy to navigate your site when they’re on the go. You can rest easy that your visitors will get the optimal user experience; in fact, the site builder allows you to preview your site in some sizes. Furthermore, if you have an app for your business, you can provide a link to the appropriate app store so that your users can download it from their mobile device. Free Hosting: The site builder comes with free hosting on a secured server (Site123 owns its dedicated servers), so your site is available to others from the time you first hit save in the site builder. Your site is accessible via the free Site123 subdomain, but if you upgrade to any of the paid subscription plans, you can easily use a custom domain with your site. SEO: Your site has been built with SEO in mind. The HTML includes the appropriate tags, and you can get automatic redirection from your old site if necessary. Furthermore, Site123 automatically generates a sitemap for your pages so that search engine crawlers can use with ease. Free Image and Icons Library: If you need additional content for your site, you can use any of the pictures or icons in the free libraries provided by Site123. You’ll have access to stock images and icons that make your site much more aesthetically pleasing. Blog: You can add a blog to your site with ease. Make regular updates to your blog, share your thoughts, and engage your users without adding complexity to your site itself. Unlimited Sites: With just one administrative account, you can build as many websites as you want (however, if you’re using a paid plan, you still need to pay for each site individually on a monthly or annual basis). Unlimited Web Pages: While some site builders limit the number of pages you can build on your site, Site123 allows you to make an unlimited number of pages. The only limitation you have is the overall storage amount, which varies based on the subscription plan you have. Email Marketing: Instead of using a third-party email marketing service, Site123 includes built-in tools so that you can keep in touch with your users via newsletters and other types of email outreach. Social Media Integration: Share the posts you’ve made on your social media accounts, and share your site and its updates to your followers on social media. One feature in particular that makes Site123 stand out from other site builders is its support for multilanguage sites. 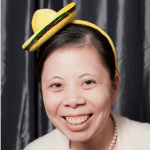 On the back-end, the site builder has been translated into 69 different languages, so regardless of what your mother tongue is, you’ll likely be able to use the site builder in a tongue that’s familiar to you. The only thing that you’ll have to build is your content, which Site123 makes easy by allowing you to open up two versions of your site side-by-side (this facilitates easy translating). Site123 will do the rest, including generating the appropriate menus for you based on the language you’ve chosen. On the front-end, you can build multiple versions of your site using many languages quickly and easily. Each version of your site gets its URL (such as mysite.site123.me/fr or mysite.site123.me/en), and your users can toggle between the different sites by clicking on the appropriate flags displayed on the upper-right corner. Depending on your plan, you can support your site in up to five different languages. Site123 supports basic e-commerce. You can easily add an always-open online store, or if you’re an artist or musician, create the galleries or libraries you need to showcase your work. There are also apps designed to help you include e-commerce functionality, such as payment processors, pricing, and even some full e-commerce suites. Video above: This Site123 promotional video provides a helpful overview of how the site builder works. To get started with Site123, simple click the “START HERE” button. You’ll find that button right on the home page of the site. It’s hard to think of an easier way to create a site. Once you click on an industry or hobby box, a small pop-up window will display sub-categories you can choose from. See our example below. 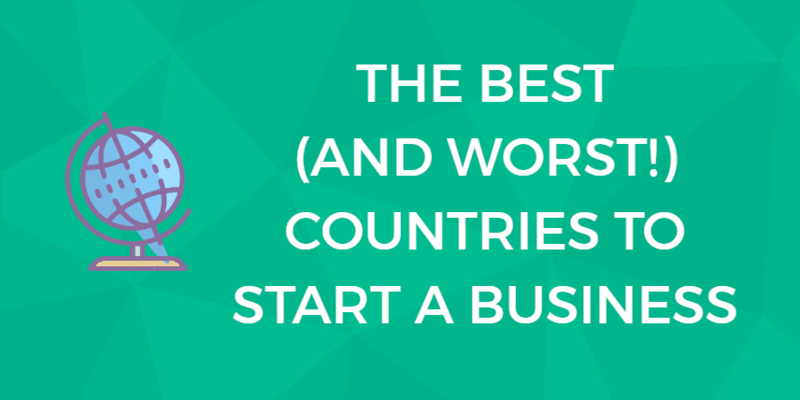 Step 1: The first thing you’ll do is choose an industry or hobby. 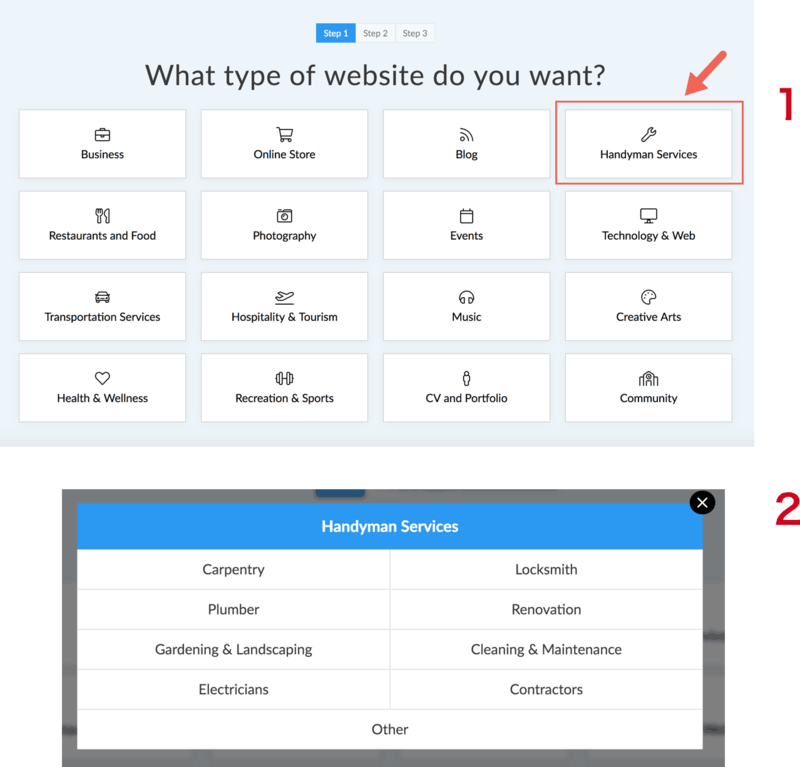 In this example, we clicked on “Handyman Services.” Step 2: A small window will pop up offering you more detailed choices like Carpentry, Plumber, Locksmith and more. That will prompt you to sign up for Site123. You can enter your name, email address, and choose a password. Or you can simply log in by clicking on the Facebook or Google button. Yes. The template is a fully-responsive site that will work equally well on desktop, tablet, or mobile. Your site will include basic information about your business, space for an About section, information about the services you offer, dedicated areas for large images, a contact area, and a Google Maps integration that lets your users know where you are in the world. To be clear, Site123 is not a drag-and-drop builder. For example, you might be familiar with Wix, which is a drag-and-drop option — you can move things around and add features as you see fit. All of your changes are reflected almost instantaneously in the what-you-see-is-what-you-get (WYSIWYG) editor. To get a different layout for your site, you will have to choose an alternate theme (whose design includes the new layout you want). Site123 offers more themes than you need. You’ll find the process of choosing one to be refreshing. You simply click on an industry or hobby listed (like Handyman Services, Creative Arts, or Online Store). Then you’ll see additional options. For example, click on “Creative Arts” then you’ll choose between Performing Arts, Visual Arts, and other options. All of the editing features you need are located in the navigation bar to your left, and it contains the following tabs: Homepage, Pages, Design, Settings, Preview, and Save. The Homepage tab allows you to change the copy, design, and layout of the landing page your users see when they first navigate to your site. The Pages tab is where you add additional sections/pages to your site. If you want a one-page website, you can choose to show your site on a single page (where all pages are displayed on the homepage, and the user scrolls up and down to view all of your content), or you can build a multi-page site, where each page is shown separately. If you don’t have enough content for your pages (such as images), you can use resources found in the content libraries provided by Site123. The Design tab allows you to change the appearance of your site. In addition to changing its layout, you can change its style (such as color scheme and link style), font, menu options, footer layout, and favicon and social media-related images. The Settings tab allows you to toggle some different configuration options for your site. The options cover things like website type, e-commerce settings, SEO options, language support, plugins, and so on. You can preview the changes you’ve made to your site at any time. You can choose to view your site as it would be seen by users on a desktop (both full-screen and not), a tablet, and a smartphone. When you save your site, your changes are published at that point and are accessible to your visitors. For a small business, search engine optimization (SEO) is crucial. Essentially, SEO is a set of practices that help ensure that your webpage is among the first ones listed when someone searches for keywords that are related or relevant to your site. Few users navigate beyond the first page of results from a search engine, so the higher your search engine ranking, the higher the likelihood your site is among the first mentioned. Meta tags: Metadata, which includes the title and description, are the pieces of information about your site that is displayed to your users when a search engine includes your website in its results. Well-written metadata is key, since it increases the likelihood that the user clicks on your link. Site123 makes it easy for you to manage the metadata for all of your pages. Sitemap: The sitemap gives search engines the information they need to find the information they want. It helps ensure that the bots crawling your site do not miss any of your pages, increasing the likelihood that users will see your page when they search for relevant keywords. Site123 automatically generates your sitemap. Redirection: If you move pages, redirection helps ensure that users can find your new page instead of getting stuck with a page that no longer exists. This allows you to keep the rankings you have previously built. With Site123, redirection is built into your code, so you do not have to manually manage this. Webmaster Tools: Site123 allows you to integrate easily with Google Search Console (formerly known as Google Webmaster Tools). This allows you to see what Google sees and to identify what you could do to improve your search rankings. If you wanted to, you could easily use Site123 for free forever. While you would see caps on how much bandwidth you used (1 GB max) and how big you can make your site (you get 500 MB of disk storage space), you would still have access to almost all of the features included in the site builder itself. If you have an ecommerce store, you can handle a maximum of ten orders per month. The biggest downside to the free plan is that you don’t get support for multiple languages. Site123 offers two plan options for building a website: a free option and a paid, premium version (the price listed is the monthly fee, but Site123 only bills annually). Site123 accepts PayPal and all major credit cards. Keeping in line with their support for individuals and small businesses around the world, you can toggle the checkout page so that prices display in your local currency. While Site123 allows you to pay for your subscription plan on a month-to-month basis, they offer significant discounts if you opt to pay upfront for a twelve, twenty-four, or thirty-six-month contract. You’ll see savings of 11%, 22%, and 33%, respectively. If you’re unsatisfied, you can get a full refund of all fees paid if you cancel within fourteen days of initiating service. Site123 doesn’t make any mention of an uptime guarantee, but they do indicate that your site will be stored on hundreds of CDNs around the world. This means that those navigating to your site won’t have to wait as long to load your site (this is especially important when it comes to your mobile users since they are typically using slower networks). Site123 offers one of the better support packages to their users. As you’ll soon notice if you navigate to the site, there’s an animated icon on the bottom right that you can click to launch a Live Chat session. This is one of the most popular options for their customers, and it is available 24/7. Alternatively, you can reach the support team via email. Video above: This is a typical Site123 video tutorial. It shows you how to add a digital product to your store. Site123 offers an in-depth support center, where you can find tutorials, answers to frequently asked questions, and documentation on all of the site builder’s features. If you’re a visual learner, you can view the video tutorials available on Site123’s YouTube site. There are dozens of videos covering everything from getting your account set up to creating custom integrations with third-party software suites. Site123 maintains an active presence on Facebook, Twitter, Google+, and LinkedIn, so you can certainly contact the team using any of these platforms. The editor strikes a balance between being easy to use and being powerful. Site123 focuses on novices or those not looking to do too much fine-tuning (this is readily apparent by the lack of code editing features included in the site builder — other companies try to reach customers on both ends of the experience spectrum by including an editor with a graphical interface and a code editing section). If you’re the target audience for Site123, you will certainly not find the editor provided lacking. A limited selection of templates. While some may consider this a serious limitation, those who find it overwhelming when presented with a selection of dozens of templates would be happy with just one aesthetically pleasing option. You can change the theme up quite a bit, including adding/deleting sections (or pages, if you’ve chosen to build a multi-page site), changing the site style (fonts, color schemes, and so on), and customizing the features available, but most of the work regarding design has been done for you already. If you have a multilingual audience, Site123 is one of the few sitebuilders that can support multiple languages. In addition to making it easy for your users to toggle back and forth between the languages available, Site123 has translated their site builder into 69 different languages and automatically turns the menus and navigation features of your site for you. Their editor also has a unique side-by-side view you can use as you translate your site from one language to another. Most features are available free of charge (in return, you’ll use a Site123 subdomain and see its banner on your site), but the plan upgrades (necessary if you want to use the multi-language features or need more than basic e-commerce support) are reasonably priced. Site123 offers more than 100 pre-built website designs. Select one and you’re minutes away from having a site. Discounts are available to those who sign up for longer-term contracts, which reduce the month-to-month cost. We don’t think you’ll have any issues working with Site123, even if you’ve never built a site before, but if you do have any questions, Site123 offers an extensive array of self-help materials. You can also reach their customer support team via email or 24/7 live chat. Few other site builders offer as much help to their clients as Site123. All-in-all, Site123 is certainly an option you should consider if you don’t mind being locked into a particular aesthetic for your website. Here are a few commonly asked questions about Site123, with answers. Site123 only offers a limited range of templates, and they’re all very similar. You won’t get the variety offered by some other popular sitebuilders. Once you select the template, you have some room to customize your layout. If you’re after an easy, quick way to get your business website up and running, the lack of options may not be a major concern. Site123 has a decent support package. You can initiate a live chat session on their website. It’s one of the most popular options, and available 24/7. You can also reach support via email. Site123’s support center also has tutorials and extensive documentation on their features. At the time of writing, the free plan started with 1GB of bandwidth and 500MB storage space. The paid plan comes with 5GB bandwidth and 10GB storage. Whether this meets your needs depends on several factors, including your site traffic. Previous: Duda Sitebuilder: Good for Agencies, Publishers, Hosts. But Is It Right For You? Next: Virb Review: Does This Responsive Site Builder Have the Features You Need?